Fish is perfect to cook in the microwave. It's very easy - just put the fish into a dish, add some liquid and seasonings and away you go. Leave the fish to steam for a minute after you've taken it out. It won't have much color, so a good plan it to sprinkle some herbs, pepper or paprika on it after it's cooked, that way it won't look so pale. The basic timings are the same, whichever fish you use as it's cooked by weight. A 5 ounce fillet will take 2 minutes from fresh - check your microwave handbook as they do differ depending on the power. 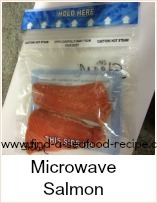 Put the fish fillets into a microwave proof dish which has a lid you can use. Alternatively, use microwave steaming bags. Lay the fish in the dish and sprinkle the lemon juice and seasonings over it. Microwave on full for 2 minutes for one fillet, 3 for two fillets. Leave in the dish or bag for one minute to allow the fish to steam a little longer. Check it's cooked - it should be opaque and firm to the touch. DO be careful when you take the lid off or open the bag as steam can scald you just as badly as boiling water. 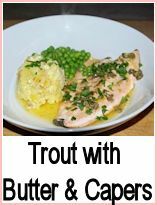 Serve with buttered new potatoes, asaparagus and peas. 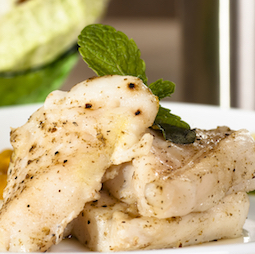 This Microwave Cod recipe is very easy - just put the fish into a dish, add some liquid and seasonings and away you go.